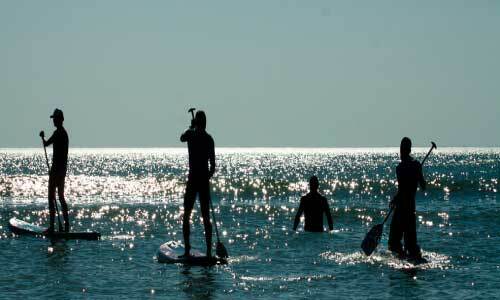 Stand up paddle boarding, also known as SUP, has become a popular craze over the past few years. SUP has become a lifestyle choice for people looking for a rowing work out or just want a relaxing day out on the water. With the paddler standing, it offers a unique look at the water below or a look at the horizon. It is also not as expensive as most water sports activities because all you need is a stand-up paddleboard and a paddle. To ensure you have a great experience you need the right equipment. Before we go over the top 10 best stand up paddle boards, you need to know about the different types of SUPs. 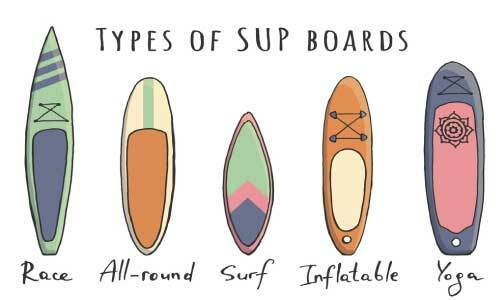 For more information on these types, you check out our guide How to Choose a Stand Up Paddle Board. 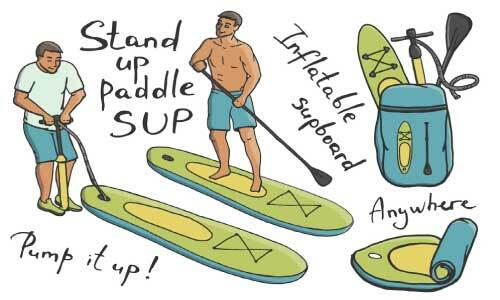 Inflatable Stand Up Paddle Board – If you are short on storage space then an inflatable paddle board is your ideal SUP. They easily inflate and deflate so they can be stored in tight spaces or the trunk of your vehicle. They are lightweight but are not recommended to be used on the water where you will be hitting waves. 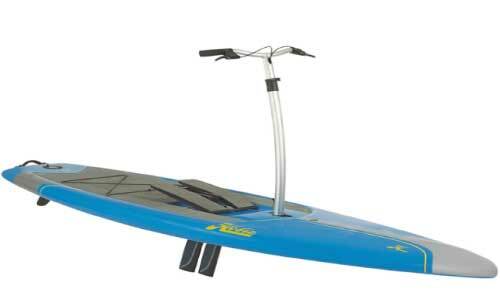 Recreational (All-Around) Stand Up Paddle Board – Recreational SUPS can be used for multiple lifestyle needs. If you are a beginner then these boards are perfect for you. They are a multi-purpose board that can be in different water types. Racing Stand Up Paddle Board – If speed and/or competing is on your mind then this is the SUP for you. These boards are built to be long, narrow, have a pointy nose, and a long fin. They are recommended to be used by experienced riders because they are not as stable at slow speeds. Yoga Stand Up Paddle Board – Yoga on a paddleboard is some of the most peaceful and relaxing times you can find. They are wider to allow you to have the balance you need and the deck padding is softer to allow you plenty of comfort. Most boards have places for you to attach resistance bands or an anchor so you do not drift into open water. 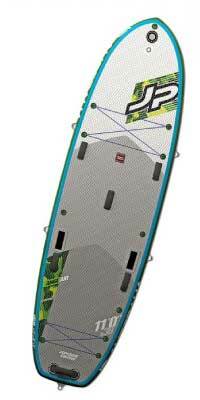 Fishing Stand Up Paddle Board – Fishing SUPs are gaining popularity among fishers. They allow you to get to those secret spot’s boats are not able to gain access to. They are wider than normal SUPs to allow the fisher plenty of stability for easier balance while reeling in that monster fish. Length is what will determine your speed and how well your board can maneuver. Shorter boards allow you easier maneuverability while longer boards give you more speed. This is why determining the way you want to stand up paddle board is extremely important and should be decided first. Less than 10 feet – SUPs that are shorter than 10 feet will allow you to turn and handle your board easier. If you are looking to surf with your SUP then this is the perfect size for you. 10 – 12 feet – This size SUP gives you a balance of speed and handling. If you are not looking to surf or race then this is likely the size you will choose. Greater than 12 feet – Paddlers looking for speed or looking to paddle long distance then this is the size you will want. If you are looking at this size then you need to know they offer less maneuverability but is not needed when using to race or go for a leisurely paddle long distance. The width of a SUP allows you the stability you need based on how you intend to use your SUP. Wider boards offer more stability for if you are fishing or doing yoga but takes away from speed and handling. Paddleboards will vary between 25 – 36 inches. Below are other factors that will influence your decision. Skill Level – Wider boards are recommended for beginners because they offer better stability and balance. 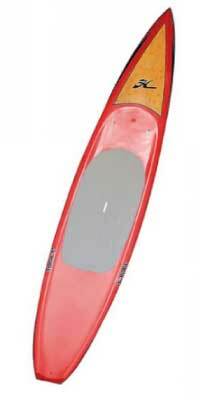 As you get more experience you can venture into paddling a narrower board. Style of Paddling – As said before, wider boards are recommended for people who will be fishing or doing yoga because you will get the stability that keeps you from falling off your board. If you are looking to race or surf then you will want a narrower board because handling is not a major need. This is the simplest decision you will make. The thicker the board the more buoyancy the board has. The reason you want more buoyancy is for if you plan on carrying more weight like heavier gear, kids, or dogs. Over the years people are starting to turn towards opting for inflatable stand up paddle boards over rigid stand-up paddle boards. Both offer different advantages but below we go over each so you can decide which is best for you. 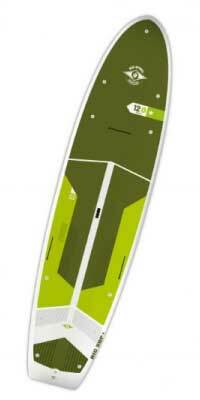 Storage Space – If you are short on storage space then this is the SUP you want. They can be deflated so can fit in a closet or in the trunk of your car. If you are camping or hiking then an inflatable SUP can be easily packed away in a bag to tote with you. Yoga – Inflatable SUPs offer a little more “give” to give you more comfort when doing your Yoga poses. Traveling – If you need to drive a long distance or take an airplane to the destination then inflatable SUPS offer easier transport. Stability – Rigid SUPs are more solid and offer a more stable and often a faster ride. More availability – They have been around longer than inflatable SUPs so they are available in more lengths and widths which allows you to choose the exact size that fits your needs. More Durability – Rigid SUPs are solid so it cannot be punctured like an inflatable SUP. This allows rigid SUPs to last longer. 11' X 38″ 456 lbs. 11' X 34'' 300 lbs. 12' X 34'' 280 lbs. 12''' X 35'' 275 lbs. The AnglAIR is an extremely stable inflatable SUP that it is fishing specialist in the JP line. It features Scotty mounts, bungee tie downs, stake out loops, kick-up fin and most importantly a super wide and stable platform for a relaxed day on the water. The AnglAIR features a bungee rope on both the nose and on the tail, plus a paddle holder and two Scotty mounts on the tail. It also features a self-regulating pressure value for optimal inflation. The new BIC SUP Cross Adventure Stand Up Paddleboard blends the excellent performance characteristics of surf-inspired SUPs with touring style SUPs. This combination of design allows this SUP to perform exceptionally in many conditions, particularly inland lakes and calm sea conditions and offers a perfect platform for all-round family fun, cruising, fitness, & yoga. It has a full-length deck pad for extra comfort during yoga and extra control while paddling. It also provides ten attachment areas so you can store a cooler, anchor, or any other piece of gear you would need. The Cross Adventure is an incredibly stable board for riders up to 300 lbs and provides an excellent platform for SUP yoga. The Kaku Kahuna SUP offers all the features a beginner or avid fisherman needs. Its design gives you extreme stability, versatility, and durability. It lets you customize your fishing experience like no other fishing SUP on the market. It is made of rugged polyethylene, so you won’t have to worry about scrapes and dings like with a fiberglass board. On this SUP you have 6 tie-down points for coolers, seats, crates, or any other piece of gear you want to bring. If you need additional mounts then the Kaku Kahuna SUP has threaded inserts that allow you to attach additional tracks. The Kahuna is the only stand up paddleboard that features a fully integrated Micro Powerpole mount which allows you the strength and durability to reel in that mammoth catch. It’s also got front and side handles, a dry hatch, and front bungee. The all-new Hobie Mirage Eclipse stand up paddleboard is taking standup to a whole new level. This SUP is incredibly stable and is fun and easy to use for beginners and experienced paddleboarders alike. There is minimal setup so it is easy to go from the car to the water. The Mirage Eclipse is the perfect board for someone who wants to take their fitness out of the gym and on to the water. Rudder controls on the handlebars make steering the Eclipse easy and intuitive. The kick-up rudder means you never have to worry about damaging your rudder blade, even when the board is beached. Rear gear tie-downs and bungee means you can take a cooler, crate, or any other type of gear with you on your adventures. Let us say that there is a day that you wish that you had a traditional paddle board, well you are in luck because you can easily remove the drive and handlebar and the fin can be locked in place. When you are in the need for speed then the newly designed Hobie SUP E-Tour BCXC 14-0 Stand Up Paddleboard is what you want. Its sleek design makes this SUP fast and efficient in all conditions while providing a stable confident feeling on the water. It features the new BCX+C construction which brings together the natural strength and flexibility of a thin veneer of Bamboo sandwiched between multiple layers of fiberglass compressed into a mold to create a strong and lightweight high-performance outer shell over an EPS core. The rails are then capped in Carbon fiber adding extra stiffness and rail strength. The result is a light, rigid and impact resistant board sure to perform in any condition. So if you read this guide then you were in the search for the best stand up paddle boards. Just like everything else, the first thing you need to know before choosing your SUP is how you intend to use it. Are you wanting to fish, race, do yoga, or just go for a cruise? Once you have that decided then it will make your decision a lot easier. Listed above is our consideration for the best SUP for each type you may need. As a team, we have used and tested many different variations and can confidently give our recommendation on each of these.